An electrically isolated amplifier that is suitable for connection to most types of thermocouple probe. A raw millivolt mode also allows isolated measurements of small potential differences. 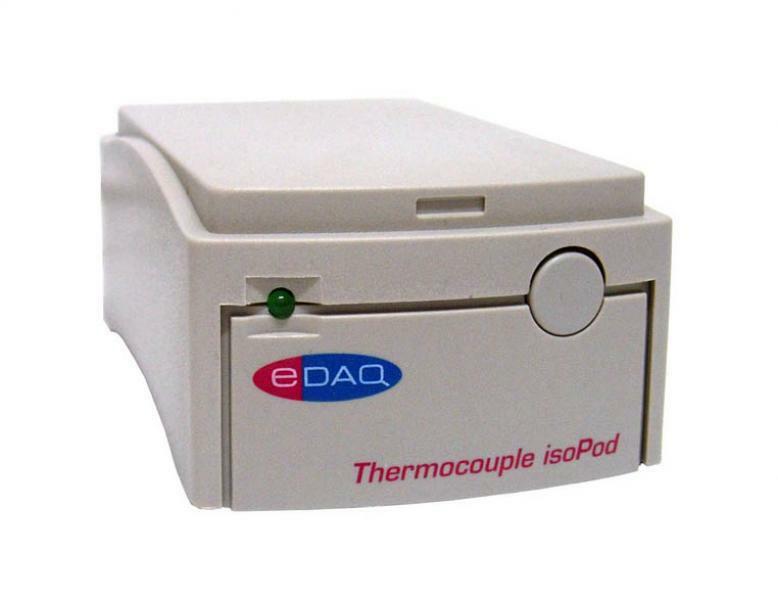 Electrical isolation ensures that temperature readings are not influenced by nearby current sources such as polarographic oxygen electrodes, or voltammetric electrodes. Polynomial signal correction is performed for each thermocouple type ensuring accuracy at least as good as the probe specification. Connects directly to computer USB port, or via a USB hub, and uses eDAQ Pod-Vu software to log and graph signals directly to a Windows XP or later computer. Note that Pod-Vu software is shipped with USB isoPods and can be used without a license with a single isoPod. You must purchase a license to use Pod-Vu software with two or more isoPod units on a single computer. writing your own software, for example in LabView, C#, Visual Basic, etc. terminal emulation software compatible with serial (COM) ports, eg TeraTerm, HyperTerminal. other serial (COM) port compatible software that can log responses into a file or Excel document, eg WinWedge, HyperAccess.